When it comes to the low-end is there any point in pre-overclocked graphics cards? Here we have the Palit GeForce GT 240 Sonic 1GB; at its most basic, a hybrid of the 9600GT and 9800GT, but made on the new 40nm process like the previously meh (sic) GT 210 and GT 220 releases. This overclocked edition from Palit is the 1GB GDDR5 version and at £80 it's jumping into an incredibly packed area of the market. To be truthful, all areas of the graphics market are pretty crowded at the moment, but the shade-under-£100 mark is more jam-packed than most. Technologically, you're looking at a card that's essentially half the GPU the GTS 250 is. With half the texture mapping units and half the ROPs of the older card it's obviously not going to catch up. It's also got a slower clockspeed and half-size memory bus. All this adds up to a card that isn't going to win any friends at the higher resolutions. At £80 it's only a few pounds cheaper than the superior GTS 250 and that's a card that is more than capable at the eye-straining resolutions; ably demonstrated by the AT-FX Unleashed machine. That rig was pushing 30fps at 2,560 x 1,600 on the highest settings. Strangely, the 9600GT and 9800GT both had the larger memory bus and higher ROPs count, but the GT 240 still manages to best those older graphics cards. So with the pricing of this Sonic edition sitting so close to the GTS 250 is there anything to recommend this card? Well, like the standard GT 240s, this overclocked chip doesn't require any additional power over that provided by the PCI-e bus. It's also got DVI, VGA and HDMI outputs and an incredibly quiet fan. Despite the fact that this is a dual-slot card, it would fit quite happily in a media centre machine and offer up a fairly decent gaming experience too – especially at TV resolutions such as the ever popular 1,366 x 768. But for those of us with our PC tied to the desktop though, probably not. The non-overclocked versions of the GT 240, and Palit also do a 1GB version as well as a 512MB edition, which sit around the £60 mark. A far more reasonable price-point for this diminutive graphics card. 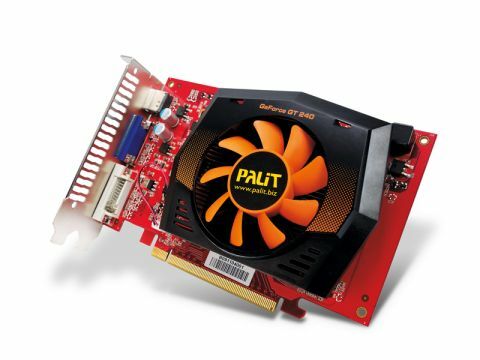 The GTS 250, and AMD's 5750 incidentally, are far better options for this sort of asking price.